Kaimei High School is full of eccentric individuals, students, and teachers alike. Amongst the school's many clubs is the SKET Brigade, officially known as the Living Assistance Club. Comprised of the somewhat idiotic Yuusuke "Bossun" Fujisaki, the gallant Hime "Himeko" Onizuka, and the silent but surprisingly popular Kazuyoshi "Switch" Usui, the SKET Brigade is dedicated to solving various problems on campus. However, the club rarely receives requests, so the members spend most of their time messing around with random, trivial matters. Both hilarious and heartwarming, SKET Dance is a lighthearted comedy following the daily high school lives of an odd trio of friends. 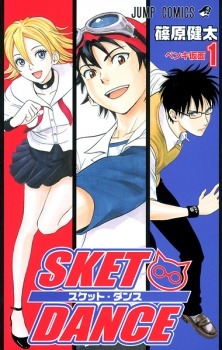 SKET Dance won the 55th Shogakukan Manga Award for best shounen manga in 2009. Note: More than a review, this is more like a short, personal reflection after reading the entire manga, so if you are looking for a very specific or detailed review, you won`t find it here. It`s always sad when a story that you like a lot eventually comes to an end. I must say that chapter 286 made me tear up a bit, which is something that i rarely do whenever i'm reading/watching something, even if i like it an awful lot. But yeah, Sket Dance was able to do it and now that i have read the last chapter, i can finally say that it was a pleasure to read such an interesting story with such likable characters that i will surely miss. Reading the final chapter was almost like saying goodbye to an old friend. You know, that kind of friend you had for a long time and were especially close with and then he ends up slowly but gradually disappearing from your life, both you and him/her following differents paths in life because that's how it is and that's how life works. But even if you end up having to say goodbye to them, the memories are still there and you'll nevertheless cherish the time you spent together. That's how i feel towards Sket Dance. It was one of the first anime/manga that i've watched and one of my favorites for a long time. It made me laugh (a lot). It made feel sad (often). It even inspired me to become a someone better, to help others (the same way GTO did to me). All in all, Sket Dance is a series about helping and saving others. But you can only help others if you can also help yourself and only if you are able to rely on other people to guide you along the way. It's by giving that very first step that you can become a better person, that your world might change and advance towards something more meaningful. Isn't it a wonderful message? This is my review for SKET Dance. I'll be referring to the characters by what they are most commonly called in the manga. Please note that this review is structured around how I personally felt about the manga: objectively, it deserves an overall rating of 9 (individual ratings being 8/8/10 for story, art, and character, respectively), but subjectively, I give it a 10. As this is a mostly a comedy shounen series, it does not have much of a plot. We get chapter and chapter of hilarious moment by the SKET Dan. So why did I give the story a 9? That's because of the drama in this series, which many people tend to overlook because it is mainly just comedy. Sprinkled throughout the chapters are the backstories of our three main characters, Bossun, Himeko, and Switch. These arcs are extremely well done, and they serve to remind the reader that the manga isn't all light hearted fun and games. As you might've figured out by now, these sections are all extremely sad, but we get to see their emotional development as they battle through their problems; these backstories explain how each of our three main characters came to be the way they are presently. They are also not one and done, as all the backstories are only explained halfway, only for them to pop up later on when the reader probably forgot about them. The manga wraps up all the problems presented in an excellent fashion, as all of them are resolved, except for one of them, which will become obvious as you are nearing the end. The characters tend to break the fourth wall very, very, often, so be on the look out for this as you're reading! Another great aspect is the art. There is nothing much to say here, as it is very cleanly drawn. All the characters are distinct from each other, so it's not hard to tell who is who. We also have art shifts very often, as they are used to enhance the joke or comedy in that particular chapter. Character expressions are also gold as well, especially with Bossun's faces. Hands down SKET Dance's strongest point. The mangaka has somehow managed to create three characters that compliment each other terrifically. These characters in question, of course, are Bossun, Himeko, and Switch. They are all so different that it's a miracle that they can get along, but each individual's qualities make them seem real. All of them tend to have over exaggerated reactions towards the simplest things, and the way they talk and act make them very likable. The supporting characters are nothing to sneeze at either. Although there are tons of them, each one has his or her own eccentricity that even if they don't appear for multiple chapters in a row, you will probably still remember their name once they do appear. A certain someone often makes comments regarding this! I doubt anyone can dislike any of the main characters, despite how seemingly ridiculous and over the top they may seem. It took me a full 3 months to go from the first chapter to the last chapter, mostly because of my lack of time. SKET Dance's length is a good thing, as there are always new jokes being introduced, and some of the chapters had me laughing like a maniac. If you like comedy, especially the tsukkomi and boke routine, this is the manga for you. After reading the last chapter, it made me stop and reflect on my life, and how blessed and lucky I was to be able to read about the SKET Dan's adventures. It was an awesome ride all the way to the finish, and SKET Dance will always have a place in my heart. That's all I have to say. Thanks for reading! Fujisaki Yuusuke (bossun) creates a club to help people, SKET-Dan with 2 of his friends, Onizuka Hime (himeko) and Usui Kazuyoshi (switch). this club takes a lot of kind request, from taking care of monkey until find a missing item. character is one of the strongest point of this manga. each of the three main characters (bossun, himeko, switch) have a very interesting background story, and all of them is a bit tragic. but without having that, maybe they won't meet each other, and there will be no SKET-Dan. Switch is a unique case. because of a certain incident, he can't speak. no, he didn't lost his speaking ability, he just don't want to speak. he always using his laptop to communicate with others. his computer and engineering skill is amazing, and he has a lot of information that'll be useful for SKET-Dan activity. I think this may be a series that you will either love or hate, since it is not the traditional series a person would see in Weekly Shonen Jump. The plot is based on a group of high school students, known as the Sket-Dan, and they assist the people in the community by doing odd jobs. Immediately, you may think that this is a rip-off of the series Gintama, but it does have a few similarities to Gintama. For one, it has a 3 person group that consist of 2 boys and a girl. One being the main character of the story, the other being the mediator of the group, and the girl being the strength of the group. For the most part, there really isn't a big narrative to the story of Sket Dance, since it mostly depends of the aspect of character interaction, and episodic chapter layouts. However, this is done very well, so there isn't much to worry about. Sket Dance also has some of the best character development arcs for the protagonist of the series. Overall, this is a very enjoyable series, and I recommend anyone to try it out.